Demand from car manufacturers for quieter tyres to improve the experience for novated lease and fleet buyers has always been high. As the quality of vehicle sound proofing improves it becomes quieter inside the cabin, so the focus turns to external sounds such as road and wind noise from tyres. Pirelli OE tyres equipped with innovative Pirelli Noise Cancelling System (PNCS) technology numbered 78 by the end of 2017. One year later, the figure increased by 100%, now making a total of more than 150. This system created by Pirelli has been on sale since 2013 and is increasingly requested by the world’s best-known carmakers, especially those in the premium and prestige sectors, to offer greater comfort to drivers and passengers. Pirelli are not the only manufacturer with this technology. Most tyre manufacturers supplying OE fitments have developed noise cancelling technology. Hankook supplies OE tyres to several vehicles including the Audi Q7. They claim the sound absorber reduced noise by 4-6 decibels. This technology is designed to reduce perceived noise on the inside of the car, derived from the interaction between the road surface and the tyre itself. Thanks to Pirelli’s PNCS, this road noise can be reduced by up to 25%, as if the car were travelling on only three wheels. It’s made possible thanks to the use of a specific sound absorbing material placed within the tyre, which absorbs vibrations in the air that would otherwise be transmitted to the inside of the vehicle, creating annoying background noise. This ‘sponge’ is made from foam consisting of open cells that maximise the working surface of the material, intensifying the deadening of vibration, and therefore reducing noise. 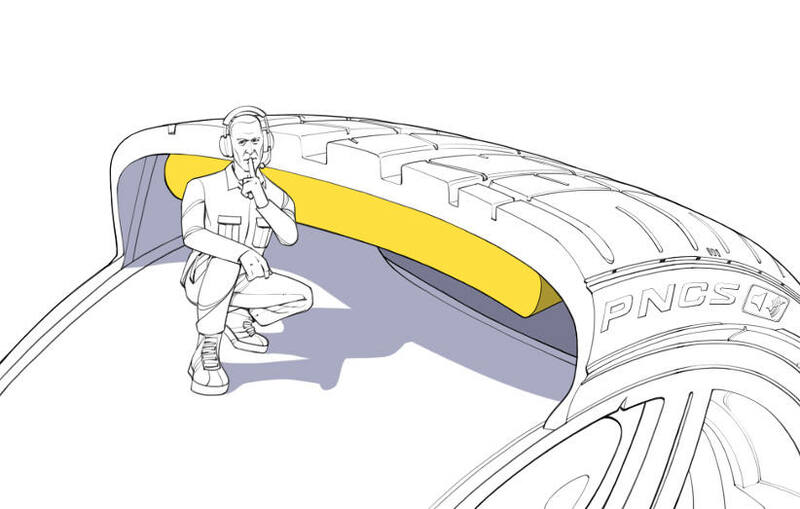 Tyres equipped with this technology can be recognised by special markings on the sidewall, which depict a speaker and soundwaves with a bar through them, next to the PNCS symbol. Owners of vehicles equipped with PNCS technology are advised to always buy appropriately marked tyres specifically made for their cars, in order to continue to enjoy the advantages of this relaxing technology. Of course, it’s also important to look after the tyres properly: maintaining the correct tyre pressures as advised by the manufacturer also helps to contain road noise. Maurizio Boiocchi, Pirelli’s Executive Vice President of Technology and Innovation, said “Alongside tyre development, Pirelli also works every day on technology designed to improve the lives of each and every motorist: Run Flat and Seal Inside minimise the risks associated with punctures, while PNCS improves comfort on journeys. These specialities are much in demand from premium and prestige carmakers, helping to ensure the highest standards of quality. Pirelli’s contribution can be seen from nearly 3100 homologations, of which more than 770 are linked with these specialities, and more than 720 are marked tyres that identify the actual car manufacturer.